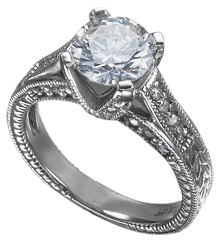 This stunning cathedral style ring with detailed antique engraving is an intricate classic! This setting can hold a center diamond of various sizes. As the center diamond changes, the setting will also change. If you choose a center diamond ranging in size from 1.90 carats to 2.25 carats, twenty-eight round diamonds, measuring .01 carats each, and twelve diamonds, measuring .0075 carats each, will be set into the prongs, the shoulders and the engraved sides of the ring. All thirty-eight diamonds are G-H in color and have a clarity of SI with a total weight of .36 carats. Please see below for more center diamond sizes.